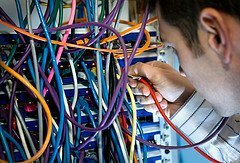 The data center technician career path is more exciting than it may appear. Although it can be generally said that all engineering fields allow for a good deal of customization in terms of specialization, data center careers are unique in that they are simultaneously versatile and consistent. To begin with, networking trends cover varied fields such as big data analytics, cloud computing, mobility, and social business. All of these are in the beginning stages of the development, which is guaranteed to be rapid and branch further. All successful professionals start by anticipating the trends and building up on that. Unlike with similar IT-related fields, data technicians do not necessarily have to have a degree in engineering. That is not to say that the latter is not usually preferred, but it is not mandatory as such. In fact, many companies wish to expand their services fast, and the shortcut to it is by providing the relevant certification to the employees. Possibly the best example in that regard is the famous Cisco certification. The CCNP (Cisco Certified Network Professional) Data Center credential is held in high regard unanimously around the globe. The certificate holders specialize in technology architecture and solutions. Another popular option is CNet Training’s CDCMP (Certified Data Centre Management Professional). The certificate holders specialize in data center management and business strategies.